JP Arencibia had 4 RBIs on Monday. Beat the Yankees and you’ll earn a smile from every Blue Jays fan. Beat them up like they’re rich-brat Little Leaguers and you’ll start to get some serious attention from the rest of the league. J.P. Arencibia delivered the big blow — a bases-loaded double — in a five-run sixth inning as the Jays smacked around the Bronx Bombers in a 7-3 win on Monday that’s sure to raise eyebrows in the States from fans wondering if this team might be more than The Jose Bautista Fireworks Show. Arencibia finished 2-for-4, adding an RBI single in the eighth that gave him a fourth RBI on the night, and J-Bop belted his MLB-leading 19th dinger as the Jays improved to 9-3 in their past 12. One day after it looked like the end of the world — as far as Jo-Jo Reyes and the Jays might know it — was upon us, Jose Bautista showed the future just could be pretty damn bright. We’re all still here. And Bautista is still hammerin’ balls the way those Bible thumpers who think the apocalypse is now smack “the good book.” J-Bop ended the scoring in the ninth with a solo shot, his major league-leading 18th. 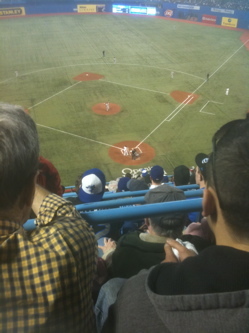 Yunel Escobar also went yard, plating the winning run with a two-run blast in the seventh that put the Jays ahead 6-4. Escobar was instrumental to J-Bop’s big hit in the sixth when he grounded to shortstop, a ball Houston’s Clint Barmes let slip through his legs. That spelled doom for the ’Stros. In a way the outcome makes up for Friday night, when the Jays blew a 2-0 lead in the eighth inning, costing the winless Reyes that oh-so-coveted first victory. Jon Rauch blew the lead and Frank Francisco gave up three runs in the ninth to take the 5-2 loss. Thanks to Bautista and Escobar, though, the sting from that one didn’t last so long. Look at what a few runs and solid starting pitching will do. Jose Bautista went deep again and Corey Patterson swatted a three-run shot during a six-run fifth inning that put an end to the Jays’ two-game skid. Kyle Drabek (2-0) went six innings, allowing three runs and lowering his ERA to 3.30 in a 6-4 win over the tough Rangers (14-8). Refreshingly, Toronto fans didn’t have to sweat out a win for a change. A few more like this and someone in marketing will have to think about this: Hustle. Heart. Homers. Hallelujah! Should we stuff the ballot box for Johnny Mac on May 2? This country needs a great leader — why not a guy named John McDonald? McDonald’s homer — which came on an Adam Russell sinker that stayed in the middle of the plate — keeps the Jays (9-10) in second place in the AL East. He drove home Juan Rivera who miraculously managed to get a hit. The homer also rewards McDonald’s teammates for playing tough yet again — it was their seventh come-from-behind win of the year — and sends a not-so-bad crowd of 23,192 home happy. Catchers are catchers because they can’t run. If they could run, they would be Craig Biggio and be moved to middle infield or centerfield. J.P. Arencibia is a catcher through and through, so we shouldn’t be surprised when he gets thrown out trying to stretch a single into a double, even though it looked like he had extra bases off the bat. That’s what happened, though, in the second inning on Wednesday night when Arencibia went for two and was gunned down, quelling the chants of “Cooperstown, Cooperstown,” emanating through SkyDome … Okay, it was only coming from the first two rows of Section 116, but it’s a start, right? 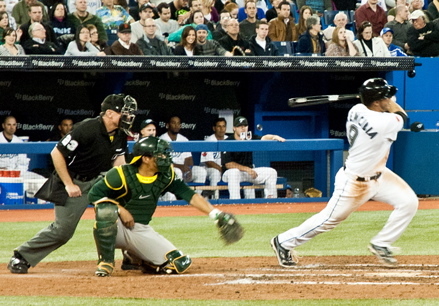 Arencibia was 1-for-3 and also threw out a runner as the Jays won again, beating the A’s 5-3 thanks to a three-run homer from Travis Snider in the fourth inning.